Here’s our list of fun places to eat and drink this week. Know others coming up? We do this every Thursday, so let us know, too. Hudson Valley Food Truck Festival: Thursday, Aug. 20, 3:30 to 9:30 p.m. at the Kiwanis Ice Rink, Saugerties. Nosh on goodies from Catskill-area faves like Pippy’s Hot Dog Truck, Black Forest Flammkuchen, Black-Eyed Suzies and more while Lindsey Webster plays. The monthly rodeo happens every third Thursday through October. Diner and a Movie: Thursday, Aug. 20, various times and locations. The Greenville Drive-in and the Cruisin ’50s Diner in Acra have teamed up for a series of Thursday night dinners paired with a scavenger hunt and a retro film showing. First up this week is Meatballs, the 1979 Bill Murray comedy. The diner opens at 4:30 p.m., offering a special dinner for four for $20. The movie begins at dusk, around 8:30. In between, visit participating local businesses to collect stamps on your scavenger hunt map (PDF) and get a free popcorn. The next two Thursdays are The Treasure of the Sierra Madre on Aug. 27 and Grease on Sept. 3. Movie tickets are $5/person. For more on the Greenville Drive-in and it’s local-food concession stand, read our recent profile. Bovina Open Barn & Studio Tour: Saturday, Aug. 22, 10 a.m. to 4 p.m., various locations. Visit farms, food producers and artists’ workspaces in and around this farm- and art-filled Delaware County town. For details, read our preview from last week. Beer, Bourbon & Barbecue Party: Saturday, Aug. 22, 6 to 11 p.m., 910 Lenape Lake Road, Livingston Manor. Support Highland Lake’s North American Cultural Laboratory at this backyard barbecue featuring food from Big Kev’s BBQ, beer from Catskill Brewery and spirits from Catskill Distilling. A raffle offers prizes like a family freezer pack of Mark Keoppen’s outstanding organic pig. Tickets are $75/person; proceeds support NACL. Cocktails in the Catskills with Photographer George Holz: Saturday, Aug. 22, 7 to 9 p.m., Phoenicia Diner, 5681 Route 28, Phoenicia. 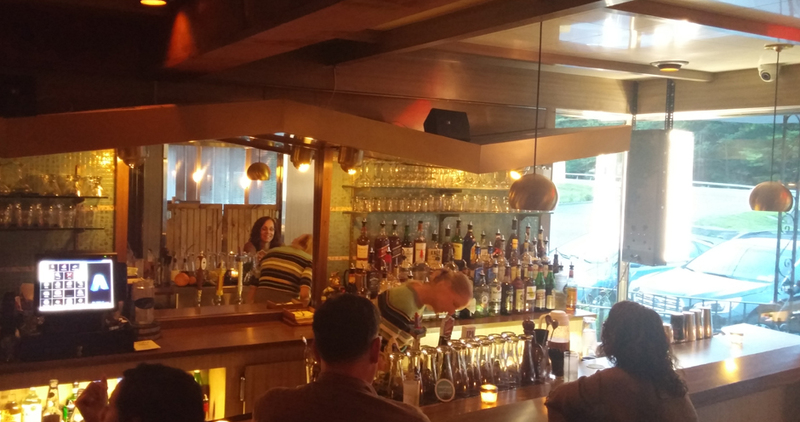 Earlier this summer, the popular breakfast and lunch eatery launched a weekend-only bar that provides a cozy setting to savor a drink made from Catskill-distilled spirits, nosh a few locally sourced small plates and unwind on Fridays and Saturdays from 7 to 10 p.m. This week, the lounge hosts a celebration of the release of Holz Hollywood, a new book of portraits of movieland’s who’s who.